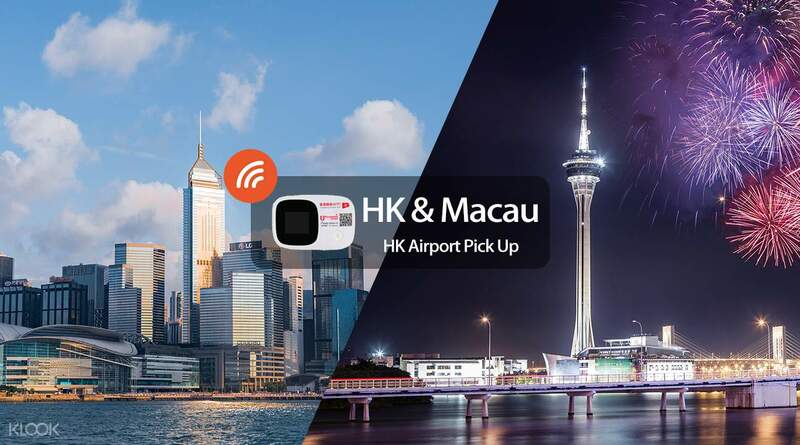 Stay connected while traveling in Hong Kong and Macau. With an easy pick up service at Hong Kong International Airport, you'll enjoy unlimited WiFi access throughout your stay. The speedy 4G portable device connects up to five different phones, laptops and tablets at once and supports 4-6 hours of surfing on one battery charge. Add some spontaneity to your travels with the ability to plan on the go and keep in touch with friends and family wherever you are! We Stayed 5 days in Hong Kong with my family and it is very must have if you are travelling to stay connected and searching for your routes going to some attraction. We also stayed one night to macau and it also works there. Thank you Klook for this wonderful experience. We Stayed 5 days in Hong Kong with my family and it is very must have if you are travelling to stay connected and searching for your routes going to some attraction. We also stayed one night to macau and it also works there. Thank you Klook for this wonderful experience. Fast and reliable. You will need to deposit 500 HK dollars when claiming it and it will be refunded once you return the wifi. Fast and reliable. You will need to deposit 500 HK dollars when claiming it and it will be refunded once you return the wifi. Value for money. Connection was fast and stable the entire trip. No problems with pick up and return. Value for money. Connection was fast and stable the entire trip. No problems with pick up and return. Easy pick up in the Mongkok Service Center. Had a safe and internet ready time the whole time in hongkong and macau. It worked in both countries really well. The device had a good battery life and easy to operate. Definitely a must book when in HK and Macau, especially for those who want to explore the area on their own and want to easily upload photos on the go. Signal is great even in the islands, like Cheung Chau and Lantau. To get to the Mongkok pick up site its easy to take the train to Mongkok and look for the building from the map of the station (for the nearest landmarks, sample map in the photos below. Easy pick up in the Mongkok Service Center. Had a safe and internet ready time the whole time in hongkong and macau. It worked in both countries really well. The device had a good battery life and easy to operate. Definitely a must book when in HK and Macau, especially for those who want to explore the area on their own and want to easily upload photos on the go. Signal is great even in the islands, like Cheung Chau and Lantau. To get to the Mongkok pick up site its easy to take the train to Mongkok and look for the building from the map of the station (for the nearest landmarks, sample map in the photos below. its very useful special we don't really know the place. Its one of the very need to travel in a other countries. its very useful special we don't really know the place. Its one of the very need to travel in a other countries. It’s very easy to redeem at the airport. The connection in both HK and Macau were very good ! I’m impressed. It’s easy to charge too :) thanks to it I can share my updates with my family everyday ! It’s very easy to redeem at the airport. The connection in both HK and Macau were very good ! I’m impressed. It’s easy to charge too :) thanks to it I can share my updates with my family everyday ! Pick up and drop off location was easy to find! Battery lasted for a good amount of time! You can charge it using your powerbank no extra wire needed cause it already comes wits its own usb adapter! Internet connection was quite good! Definitely recommend this!!!!!! A must have for any traveler!! Pick up and drop off location was easy to find! Battery lasted for a good amount of time! You can charge it using your powerbank no extra wire needed cause it already comes wits its own usb adapter! Internet connection was quite good! Definitely recommend this!!!!!! A must have for any traveler!! It's very convenient to book and pick up the wifi device at the airport. The 4G signal is very fast in both HK and Macau. The wifi device can last for about 8 hours and can connect with 5 devices. Highly recommended. It's very convenient to book and pick up the wifi device at the airport. The 4G signal is very fast in both HK and Macau. The wifi device can last for about 8 hours and can connect with 5 devices. Highly recommended. It was easy to locate the counter. The internet connection was fast and reliable. The battery can last a day. Charging time was 3 hours only but we were unable to charge it using powerbanks. A credit card is a must as you need it to pay the refundable deposit at the counter. It was easy to locate the counter. The internet connection was fast and reliable. The battery can last a day. Charging time was 3 hours only but we were unable to charge it using powerbanks. A credit card is a must as you need it to pay the refundable deposit at the counter.